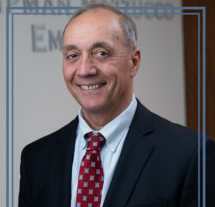 Ward J. Mazzucco is a Connecticut attorney who handles real estate and business matters and litigation arising from those practice areas. His real estate practice emphasizes development, construction, and land use cases. He also counsels businesses and professional practices on everything from entity selection to employment and from business purchases to buy-sell agreements. When disputes arise, he also stands ready to handle litigation in the state and federal courts in Connecticut. In light of his experience, Mr. Mazzucco has been accepted as an expert witness in the Connecticut Superior Court on certain real estate and business issues. He has also been appointed an Arbitrator and Factfinder in the Superior Court for the Judicial District of Danbury. Mr. Mazzucco principally serves businesses located in Connecticut, as well as companies located outside the state which seek local counsel for transactions or litigation within Connecticut.